It was this spirit of open-mindedness and conviviality uniting the audience, repertory and musicians wich drove Pablo Valetti and Céline Frisch to found in 1998 the Café Zimmermann Ensemble. They assembled six musicians – five bow instruments and a harpsichord (Pablo Valetti, Nick Robinson, violin: Patricia Gagnon, alto; Petr Skalka, cello; Ludek Brany, double bass and Céline Frisch, harpsichord). Other strings or wind instruments would be added depending on the programme. The ensemble Café Zimmermann is one of the new breed of Baroque groups offering lean, high-energy performances on historical instruments. 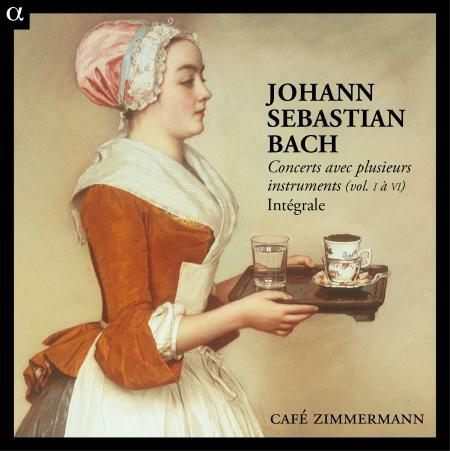 Imagined in the Leipzig coffeehouse where Bach’s Collegium Musicum instrumental ensemble might have performed in the 18th century, the one-instrument-per-part performance here is plausible, although evidence that such performances occurred in Bach’s time does not indicate that such performances were desirable. Bach himself requested an orchestra of 24 players from the Leipzig city council, and a piece like the Suite No. 3 in D major, BWV 1068, echoes French ensembles of that size. Tempi are quick, with the suite’s famous Air on a G string taken at an unusually brisk clip, but the textures remain unusually transparent, and the overall feel is lively and clear. The Brandenburg Concerto No. 6, BWV 1063, the most troublesome of the set of six with its unusual double-viola scoring, gets a rich, complex reading. Another attraction comes from the Alpha label’s practice of pairing musical works with detailed art-historical essays on a painting of the period; the work by Antwerp artist Peter Jacob Horemans, though only tangentially related to Bach, is full of fascinating details such as a cup of coffee or tea being dumped into a bowl, perhaps to be given to one of the four dogs appearing in the painting. As always, buyers of Alpha’s series can give themselves a decent grounding in art history at no additional cost.